Kimberly Martin is a Contributing Writer for NIDA NOTES. Research has shown that some children exposed in the womb to cocaine may have memory and attention deficits that hinder their ability to learn. These children also may have difficulties completing complex tasks or tests that involve distractions, and they tend to perform poorly on visual recognition memory and attention tasks. 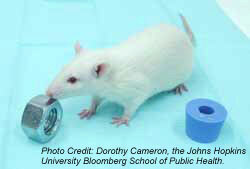 This rat is exploring an object during the two-object recognition task. He was previously exposed to one object, whereas the other is new. The rat was considered to remember the former object if he spent more time exploring the new one. Rats exposed to cocaine before birth did not demonstrate a preference for the new object, indicating no memory of the familiar object. Now, Dr. Bret Morrow and his colleagues at Yale University have demonstrated in rats that prenatal exposure to cocaine may cause long-term changes in an area of the brain responsible for short-term memory. Previous animal studies have reported negative effects of cocaine on cognitive performance, but doubts persisted about the applicability of study results to humans. The new findings help allay those doubts, which are based partly on differences in how people use cocaine and in how cocaine was administered to rats in earlier experiments. By designing an experiment that closely simulates the way humans use cocaine, the Yale team has enhanced the applicability of cognitive impairment in rats prenatally exposed to cocaine to that observed in children. "To more closely replicate the way human fetuses are exposed to cocaine, we administered the drug to the pregnant rats intravenously. This enabled us to use dosages similar to those taken by people. Also, the way cocaine is absorbed and metabolized when it is administered intravenously is much closer to what we see in humans," says Dr. Morrow. "Additionally, tests commonly used in rat studies to assess cognitive deficits--maze and swimming tests--rely on artificial manipulation of the animal’s environment, such as food restriction, reward, or stress. Our test, a two-object recognition task that relied on the rat’s own motivation to complete the task, is comparable to one used with human infants to assess short-term memory." Cocaine was administered to pregnant rats twice a day for 11 days before they gave birth. At ages equivalent to human adolescence and adulthood, the male offspring were placed in a cage with two identical objects, allowed to explore the objects, then removed from the cage. After delays of 20 minutes, 1 hour, and 24 hours, the rats were returned to the cage with one of the former objects and a new object. The time a rat spent actively exploring the new and former objects was recorded. If he spent more time exploring the new object, the rat was considered to remember the former object. To count as "exploring" time, the rat had to be actively exploring the object, with his nose within about 2 cm of the object. "The rats that were not exposed to cocaine spent more time exploring the novel object than the familiar object after 20-minute and 1-hour delays, but not after 24 hours," says Dr. Morrow. "We interpreted this behavior as memory of the familiar object from the previous exposure. The rats that were prenatally exposed to cocaine did not demonstrate a preference for the novel object over the familiar object at any time. This behavior was interpreted as their having no memory of the familiar object. These findings indicate that in the rat model, prenatal exposure to cocaine may result in long-lasting deficits in short-term memory." In a separate study, the researchers found that adolescent rats prenatally exposed to cocaine as described above had long-term changes in the frontal cortex. They showed excess activation of neurons in the prefrontal cortex, the brain area governing short-term memory. Activation was measured by the concentration of Fos, a protein produced by excited neurons. "Fos activation during development can change the way a neuron responds in the future; in other words, it undergoes a long-term adaptation," says Dr. Morrow. "In some cases, this may indicate important adaptations that help the animal meet new challenges. However, in cocaine-exposed animals, we believe that the excessive Fos activation may lead to deficits in attention and memory." "This type of animal model is valuable in guiding research into the possible mechanisms and consequences of exposure to drugs of abuse during human development," says Dr. Laurence Stanford of NIDA’s Division of Treatment Research and Development. "Animal models allow us to reduce the number of variables and confounding factors that are present when pregnant women abuse drugs. Research with children strongly suggests a significant dose effect, with the severity and presence of deficits linked to the extent of exposure. Maternal health may also play a role in the effects of prenatal drug exposure. For example, the appetite-suppressing effects of cocaine and resulting nutritional deficits can contribute to growth retardation in the womb. For the purposes of reducing the number of variables, and thus attempting to isolate the effects of prenatal cocaine exposure, this research is a valuable experiment." "This animal model may prove valuable not only for probing neurological and cognitive deficits caused by prenatal cocaine exposure, but also for testing potential therapies," says Dr. Susan Volman of NIDA’s Division of Neuroscience and Behavioral Research. Morrow, B.A., et al. Prenatal cocaine exposure disrupts nonspatial, short-term memory in adolescent and adult male rats. Behavioral Brain Research 129(1-2):217-223, 2002. Morrow, B.A., et al. Male rats exposed to cocaine in utero demonstrate elevated expression of Fos in the prefrontal cortex in response to environment. Neuropsychopharmacology 26(3):275-285, 2002.